When one thinks of Jacksonville and football, their first thought may be the Gator Bowl, the annual college football bowl game played in the city since 1946. However since 1995 the Jacksonville Jaguars have been a part of the professional football scene in the city. Decades before the Jaguars played their first game in Jacksonville their were discussions of the Baltimore Colts or the Houston Oilers moving to the city. Neither of these teams moved and in 1989, Touchdown Jacksonville! was formed to bring a NFL franchise to the city. Professional football in Jacksonville became one step closer to reality in 1991 when the NFL announced they would expand by two teams. Five cities were in contention for the two teams including Charlotte, St. Louis, Baltimore, Memphis and Jacksonville. In order for the NFL to consider the city for a team, a new stadium would need to be constructed or the Gator Bowl would have to be renovated. In July 1993 negotiations with the city to reconstruct the Gator Bowl failed and it appeared Jacksonville was out of contention for a NFL franchise. However, interest in pursuing a team did not die and the city eventually renegotiated, committing to spending $60 million to reconstruct the Gator Bowl. On November 30, 1993 the NFL awarded the city a franchise. Construction for a new stadium on the site of the Gator Bowl began on January 3, 1994 and was completed 19.5 months later by opening day, 1995. Originally named Jacksonville Municipal Stadium, the Jaguars played their first game at the stadium on August 18, 1995. The stadium consists of two, two tier grandstands of seats that are located on both sides of the playing field with the lower deck circling the entire playing field. In 1997, Alltel Communications purchased the naming rights to the stadium, thus the stadium became known as Alltel Stadium. In preparation for the Super Bowl in 2005, $47 million was spent upgrading the stadium. Upgrades included the 25,000 square feet Bud Zone sports bar at the south end of the stadium and a larger video board. In 2007, the stadium was renamed Jacksonville Municipal Stadium. 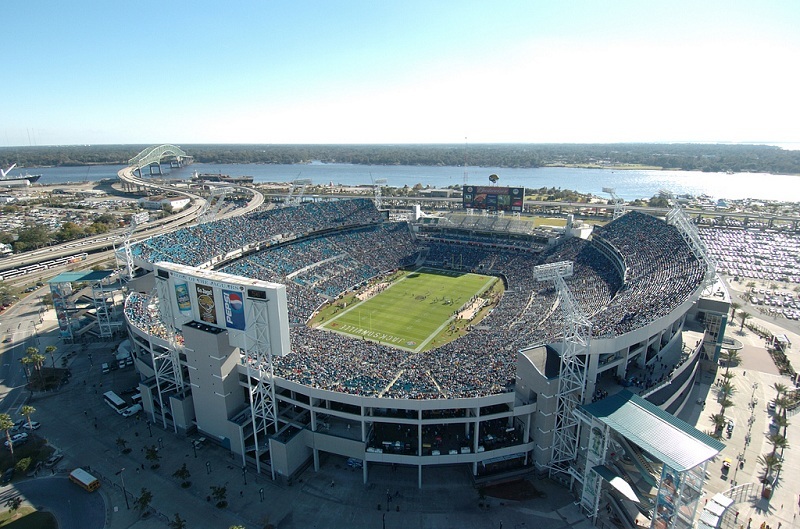 In July 2010, it was named EverBank Field after EverBank purchased the naming rights. 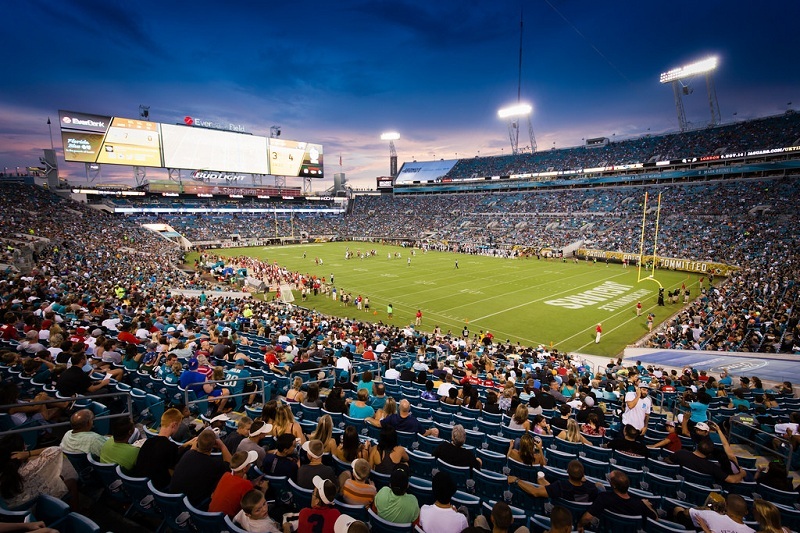 TIAA Bank purchased EverBank and in March 2018 the stadium was renamed TIAA Bank Field. The stadium has many amenities including 10,000 club seats, the Fan Entertainment Zone, Bud Light Party Zone and Touchdown Clubs. TIAA Bank Field Field hosts many other events other than Jaguars games, including the annual Gator Bowl and Florida-Georgia game. In June 2013, the Jaguars announced plans to upgrade TIAA Bank Field. Completed by the 2014 season, this $63 million project included a variety of upgrades to the stadium. Two new HD video/scoreboards replaced the existing ones in each endzone. Both measure 55 by 301 feet and are the biggest in the world. The most unique addition to TIAA Bank Field is the pair of wading pools and a two-story party deck that includes 20 cabanas. Over 9,500 seats were removed from the north endzone for construction of this area. This allows the Jaguars to remove tarps that had previously covered seats in the upper deck. TIAA Bank Field has a seating capacity of 67,000 for Jaguars games but can be increased to over 82,000 for major sporting events.